The blog has been silent of late. This is in part due to the hectic events of the last six months, and in part due to my laziness when it comes to sitting down and putting my thoughts into a permanent form. However, I now have time on my hands (strange!) and I need to write about what has been happening in my life, creatively as well as personally. In the last six months I graduated from the University of Miami Frost School of Music with my BM in Composition, spent three months in North Carolina counseling at a church summer camp, moved to Wichita, KS, and started my MM in Conducting. I also managed to transcribe my bass trombone concerto, At Sixty Miles an Hour, for wind ensemble and attend the premiere of the new version with the UCLA Wind Ensemble and Will Baker in May. And write a clarinet concerto, Grid, for the Southeast Iowa Symphony and Jesse Krebs, and Orbits, a commission for the Miami Symphony's season opening concert this month. With all of the changes in my life, one thing has come to be abundantly apparent. As much as the creative, imaginative side of my personality thrives off change and unpredictability, I fundamentally need order in my life. The first weeks of my life in Wichita were stressful emotionally and physically simply because my life lacked order and routine. Since establishing a routine, my time here has become exponentially more productive. This, I think, has helped the writing of Orbits in a larger way than I expected. Orbits was dreamed up in the wake of my senior recital, coming off the high of the premiere of my wind ensemble piece, Water Mirrors. I wanted to further synthesize my new style, aesthetic, and philosophy of music, and do it in a medium where I would have few restrictions in scope. Providentially, the Miami Symphony approached me to commission a 10-minute piece for full orchestra. And I mean FULL. The standard orchestral instrumentation these days, especially for commissions, is approximately as follows. The instrumentation of Orbits is as follows. This larger instrumentation allows almost infinite possibilities in orchestration, freeing me to write pretty much whatever I wanted-10 minutes of it! The orchestra had an idea that my piece would be about the missing link, and musically tie together Gershwin's Piano Concerto in F and Holst's The Planets, the two other pieces on the concert. However, writing a piece so inherently tied to evolution just didn't sit well with me. (See my earlier post, Soli Deo Gloria.) Instead, I chose to title the commission Orbits. The piece is inspired by order in the universe, and to a certain extent, replicates that order sonically. So Orbits takes this grand idea of gravity, magnetic attraction, and trajectory, and applies it to the realm of music. There is correlation on almost every level of the piece between the inspiration, the concept as it were, and the realization of that concept. 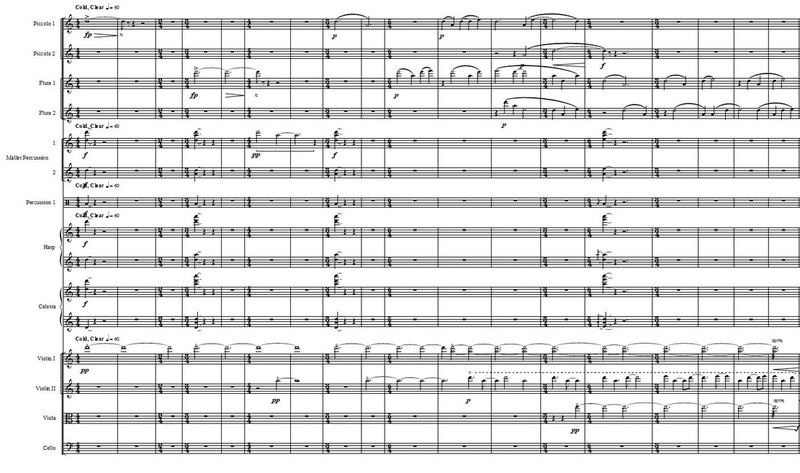 For starters, the 10-minute piece is divided into 5 large sections, basically loud-soft-loud-soft-loud. (Not fast-slow-fast-slow-fast because this is a concert opener, after all. Excitement, folks!) These five large sections appear on a universal level in the overall structure of the piece, but also on a more local level in the opening and closing material, which is made up of a miniature version of the five-section model. Thus, the prelude to the first fast section contains the DNA (as it were) of the whole piece, as does the postlued to the last fast section. So much for the dynamic aspect. The textural aspect of the piece follows a similar model. This graph of the prelude should make it obvious how the textural changes allign with the loud-soft-loud-soft-loud structure of the dynamics. In this figure, the higher the line, the higher the pitch. 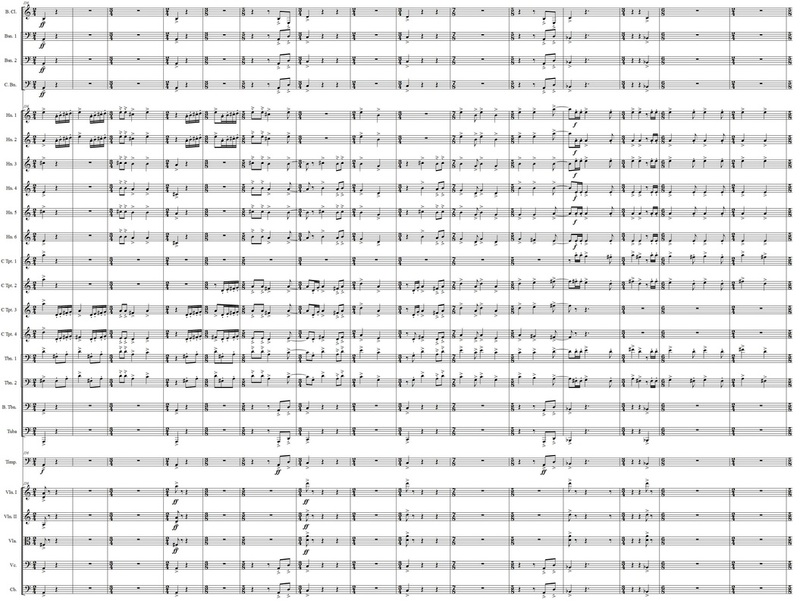 As you can see, each loud section corresponds to instruments whose range falls in the middle of the orchestra's overall range. The softer sections are dominated by instruments on the outsides of the range. This model applies to both the prelude and postlude. The bulk of the piece, however, is dominated by a different textural diagram. This graph shows, not high and low pitch, but dense and sparse texture. Once the piece really gets off the ground, the texture fluxuates between dense and sparse, at first corresponding to the loud and soft fluxuation. But as the piece goes on, the two levels fall out of sync, resulting in one loud section with a very clear texture, and one soft section with a very muddy texture. By the end of the piece, the texture reaches a middle ground, not bare but clear enough to be understandable. This graph also applies to the tonal framework of the piece. The work is based around D, so it starts and ends in D (the prelude and postlude). The middle sections slingshot around this central pitch, with the tonal center starting out at B-flat, then F-sharp (keys as far apart as possible in a chromatic system, while still centered around D). The next two key centers are C and E, then C-sharp and E-flat, then finally D again. This centering in on D is mirrored in the mode of each passage. For those who may not be familiar with the modal system, there are 7 diatonic modes, which can be best described as playing a scale of eight notes up and down from each white key on a piano. The scale we know as major (starting on C) is actually Ionian mode, and the scale we know as minor (starting on A) is Aeolian. The modes can be ordered from brightest-sounding to darkest-sounding based on which have the most emphasis on open intervals. Lydian is the brightest, followed by Mixolydian, Ionian, Dorian, Aeolian, Phrygian, and then Locrian (the mode built from B). Basically, for each of the key centers at the bottom of the graph (working up to D) I started with the darkest modes and moved gradually towards Ionian. For the key centers starting above D and moving down toward it, I started with the brightest modes and moved gradually towards Ionian. Thus, the tonal AND modal structure of the piece follows this graph. ​The final aspect of the piece is, of course, the melody. There are two principle motives the entire piece uses as the framework for its melodies. They can be distilled like this. The first motive is a rising, then falling motive. It departs from and arrives at the same pitch, initially D.
​The second motive is more parabolic, and is derived from the first five notes of the overtone series. It ascends upward by an octave, then a fifth, then a fourth, then a third, and finally, I add a minor second to round it off. This motive is like an object trying to break free of a gravitaional or magnetic field, and slowly entering orbit as it fails to have enough energy to break the horizon. The first motive is more like an object describing a wave as it moves back and forth across the center of its orbital path. Ok, forgive the ameteur use of physics terminology. But the point is, every aspect of this piece is dominated by my musical interpretation of the behavior of gravitational or magnetic attraction. Orbits is meant quite literally to reflect the laws of the natural world, and the unity, the order, that is present even amidst the chaos of creation. And there IS chaos. Both in the natural world and in Orbits. Not everything fits the way you'd expect. But in the end, there is a clear direction, a clear path, that the music follows. And this is fundamentally how I see the universe. Not as a sporadic combination of chance phenomena, but as a system of order, into which chaos has been introduced, but which is nevertheless ruled by intention, purpose, and meaning. Orbits has some really dark moments, and some unpredictable twists and turns, but ultimately it is hopeful and satisfying, triumphant even. And this represents how I see the world. Orbits has been an incredibly energizing project, which is unusual for me. Usually the creative process leaves me drained and exhausted. But I suspect that along with my new method of writing and my rediscovery of my musical self has come a new love of my art that is more constant and reliable as it is directly drawn from the very core of who I am and what I believe. If you are a hard-core classical music nerd, you may have recognized that quote right away. It is the postscript Bach signed at the end of each of his scores, and translates to "To God be the Glory". With this week marking the 500th anniversary of Martin Luther posting the 95 theses on the door of Wittenberg Cathedral, thereby ushering in the Protestant Reformation, Bach and his music has been in my thoughts quite a bit for the past several months. Bach was perhaps the first great Reformed composer, writing sacred music for the non-Catholic church. He was staunch in his assertion that every note he wrote was for the glory of God. And he sure wrote some of the best notes in Western music. But what does this all have to do with a 21-year-old composer finishing his undergraduate degree in 2017? Well, with everything going on in the US and around the world, composers everywhere are reevaluating the purpose of their music. Many are using it as a vehicle for protest. Some are using it as a means to express the hopelessness and tension of our society. Some are using it to relentlessly seek new sounds, new vocabularies, to further distance themselves from the chaos that is associated with "traditional" music. And perhaps all of these have their place. But what each composer realizes is this: their musical output directly correlates to their beliefs. Their worldview, their convictions, shape the notes they write every bit as much as Bach's convictions shaped his music 400 years ago. So I have begun to grapple with this paramount question myself. Why do I write music? It's not because I seek riches. (Because, I mean, classical music really doesn't make you rich. Common knowledge.) It's not because I want to make a name for myself. Honestly, sure I want to be famous, but there are far easier ways to achieve that result. Like, apparently, mouthing off on a talk show... Anyway, I have come up with a compositional philosophy, and some ways that this philosophy translates directly into my music, and I want to share it with you. I compose music to reflect God's character. First and foremost, my music will reflect my belief in God, as I see Him portrayed in Scripture. I aspire to something higher than simply representing the human plane of existence, though there is definitely a place for this in music. I aspire to represent the spiritual, the divine, in my music, as I have experienced it. I am aware of the enormity of this aspiration, but I think it will ensure that I am never content as a creative artist. There is always room to improve, to develop, when the subject matter, the themes of music are so high. And this, I think, is a voice that is lacking in classical concert music today. I compose music to point to the world to come. When I look at the world around me, I find myself reminded over and over that this is not reality in the truest sense of the word. The world that is now, with all of its tension, catastrophe, corruption and decay will end, and I will someday die, but in the world to come I will live on, free from all that makes our world so unbearable. This longing for the life to come is what I want to drive my musical output. I want my music to remind audiences of the existence of something more, something higher than this life. I want to reawaken in some the desire to commune with God. My music, like everything else in my life, should point to eternity, not temporality. I compose music to remind listeners of beauty and hope. Many aspects of our culture thrive on a degree of hopelessness pervasive in postmodern society. A desire for transcendent beauty has been replaced by a desire for functionality, temporary satisfaction, or novelty. This mindset is something I want to actively fight with my music. I seek to reawaken audiences' sense of beauty, with music that is both crafted and natural. I seek to remind audiences of the possibility of hope, with music that acknowledges the darkness that exists, but is not lost in it. I believe that music, perhaps more than any other art form, or indeed any other human means of expression, can convey beauty, and foster hope, comfort, love, and passion. And I think settling for anything less than this in my music would be wasting the gifts God has given me. So how does this play out in my music? Well, first of all, my music will have to be ordered. Clear form, structure, and development. Clarity of texture. Balance. All of this represents a God of order, in a world that is increasingly chaotic. Rather than imitating the chaos I see around me, I need to imitate the order I see in God's character. My music will have to be creative. If I hope to express themes of eternity, perfection, and resolution in my music, I will have to push the boundaries of my vocabulary to adequately communicate these concepts without being cliché. It is not enough to bring the spiritual down to the level of the physical. The physical must strive to raise itself toward the level of the spiritual. Clearly, this cannot be perfectly done, but assuredly settling for the normal or the common cannot aspire to represent eh extraordinary. My music cannot completely depart from convention, however. If I am trying to represent beauty, comfort, and hope through my music, it will have to be music that can connect with audiences. Connecting does not mean pandering, but it must be music that can begin to be understood. It must meet listeners where they are in order to propel them forward. Yeah, so clearly I have a lot of work to do. I am in the middle of writing the music for my senior recital, and have some other commissions on the horizon as well, so I will definitely be talking about how this philosophy ends up playing out in my compositional process. But for now, I think it is a good place to start. As a creative artist, it is incredibly bolstering to have a purpose for your art, and I feel that in the past months I have reaffirmed my purpose, and in doing so, found new drive to compose. So, in the words of one of music's greatest geniuses, Soli Deo Gloria! Today's post is about every composer's worst nightmare: EDITING! Actually figuring out what notes and rhythms are in a piece of music is only half the work. 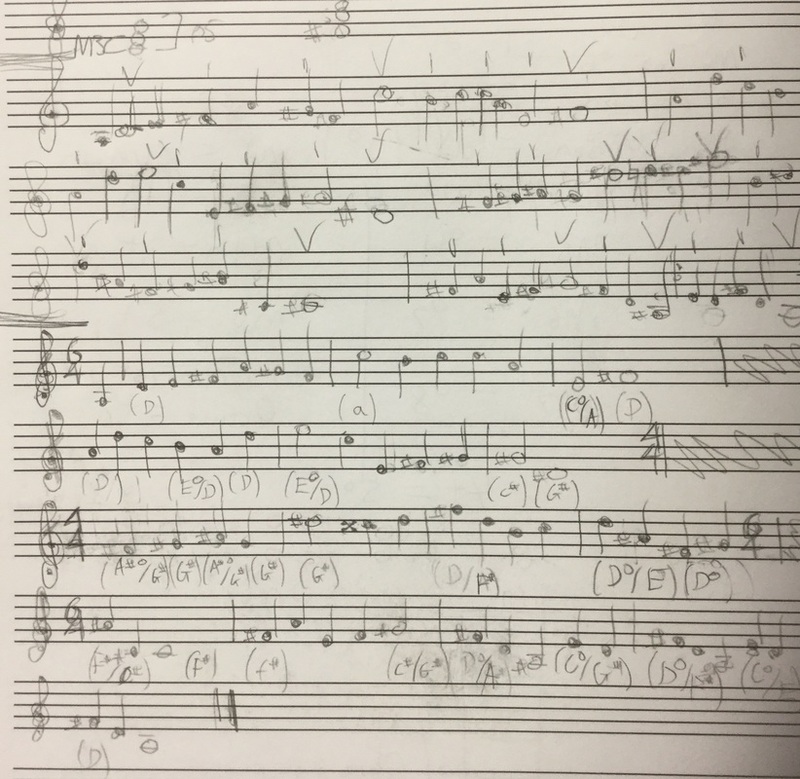 As a composer, I can figure out pretty quickly what I want my music to sound like, and write that down. But getting it from the full score (with all the instruments together) to each player-s individual part is a daunting and thankless process. Most players don't even notice if a part is edited well; they just notice if it is edited poorly. The first step in the editing process is proofing the full score. Because the instruments on each staff have large ranges, sometimes the space between staves must be adjusted to make sure that notes and markings don't overlap, which makes a score messy and hard to read. Each page needs a fairly even amount of measures; if one page has two measures on it and the next has 20, this can be very confusing to a conductor. Also, going through the full score at the beginning helps to catch typos before they become hard to fix. Many typos can be caught early in the process, saving a lot of work later. The next step is creating a "parts score", which I can use to make the notation software extract each individual line. This is necessary because, in a full score or conductor score, things like tempo markings and rehearsal letters only appear above two or three staves, but they need to appear on each part. 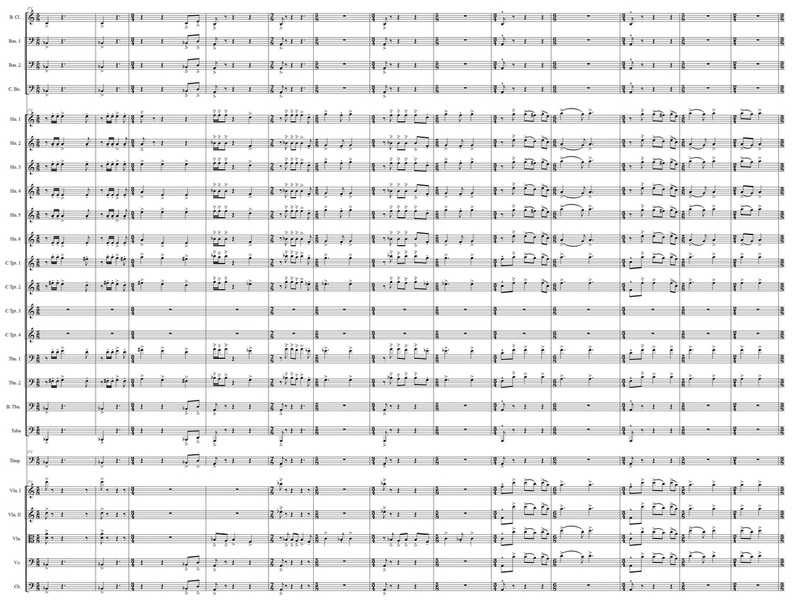 Also, fonts on a conductor score are much bigger than on parts, as the conductor score is smaller and farther away. Finally, on a conductor score, instruments are "grouped" together and each group is given a name (i.e. Clarinets) and the parts are simply given numbers (1, 2, 3) to eliminate clutter on the score. But each part needs the full instrument name (Clarinet 1, Clarinet 2, Clarinet 3) on the part, so the parts score has to display all of the names for each staff. Once the parts score is created, changing notes becomes more difficult. With any score, the more you edit it, the more mistakes you find. But once you have two scores, and eventually two scores and a set of parts, you have to edit the same error two or three times. It gets to be a lot to keep track of. The next step in the process is extracting and editing the parts. There are several important reasons for editing each part. First of all, in an orchestra, most parts are not doubled. There is only one player reading Flute 1. This measn that each part REQUIRES adequate time at the end of each page to turn the page without missing notes. The same is true of strings, as even though there are multiple players per part, the sound is noticeably thinner if half the players have to stop playing to turn a page. So creating good page turns is most of the work when editing parts. Usually this means moving staves from page to page to make sure that there are resta at the end of a page. Sometimes, a page is left entirely blank if there are no good rests for a few pages on either side. All of this is very tedious work, but pays off in smooth and productive rehearsals. The last step in the first "round" of editing is actually proofing the notes and markings to make sure there are no collissions. 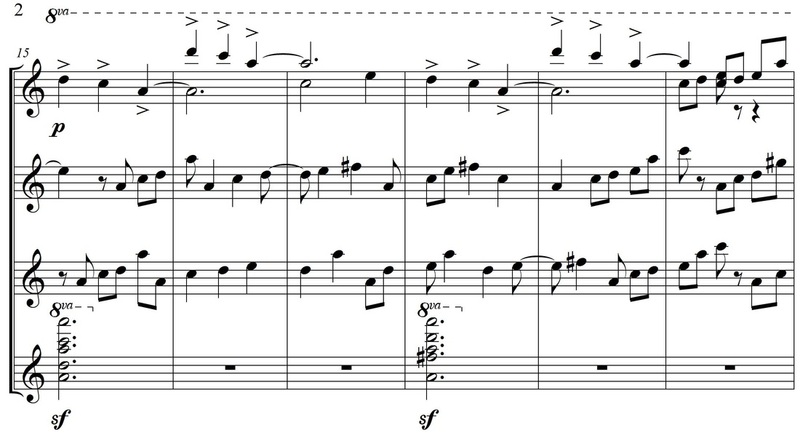 It is during this stage that most of the initial typos are found and corrected in the part, the part score, and the full score. Each page of each part must be labelled with the instrument name and page, and in percussion parts, all instrument changes must be clearly marked, and even mallet choices marked in where necessary, to save the player the time involved in figuring out which type of mallet to use. Once this is done, a final run-through of the score often helps to catch even more typos and collissions of markings that didn't get caught earlier, as it takes days to edit the parts and this gives me a frresh perspective on the score. It's the same basic principle as doing a word-search sideways: the fresh perspective helps you notice things you didn't notice before. This process took about two weeks for the symphony, and I have only finished the first round. As the rehearsal process gets underway, more and more typos will surface, and get corrected, and with every subsequent performance (if there are any) more mistakes will show themselves. 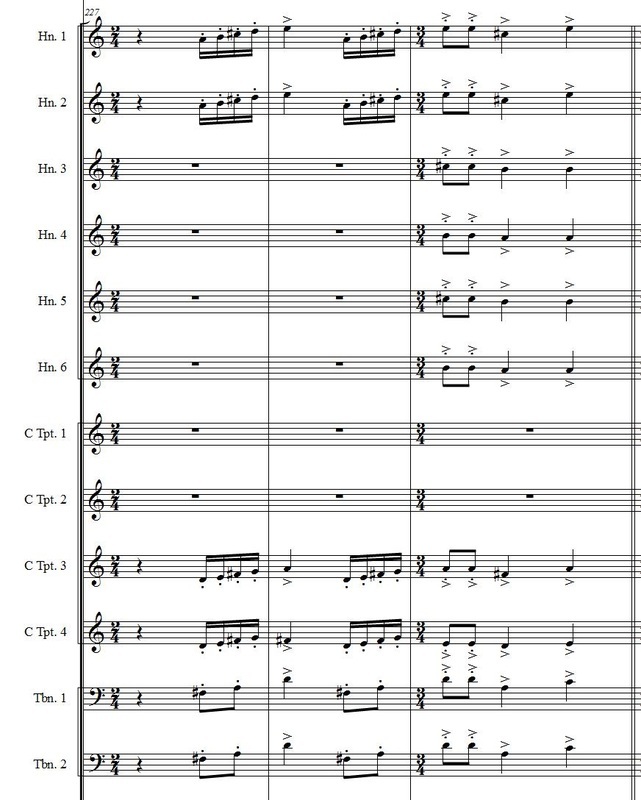 But the feeling of releif when I finally click the "Send" button on the email with all of the parts and score PDFs for the orchestra is worth all of the drudgery. So now the rehearsl process will be getting underway! The next post will probably revisit some of the earlier movements that I didn't get into as much detail with, while explaining just what happens in the first rehearsal of a brand-new composition. Until then, happy composing! Anyway, by January 1 I still hadn't done much at all on either the second or the third movement, so I blocked of this last week as my frantically-try-to-finish-a-movement week. And I surpassed even my expectations by finishing BOTH the second and the third movements! Movement Two is a lush, melodic movement, with Romantic harmonies and a calm mood. I had a melodic fragment I liked, and basically used it for all of the development sections, and expanded it into a full melody for the thematic sections. I will dig into this movement more once the rehearsal process starts, sometime in February, and explain how it is put together. But this one only took two days to write, from beginning to end. Movement Three was a bit trickier, partly because it is fast and frenzied (much like I have been lately), and partly because there is not really a melody, so there had to be several interesting motives that could interact with eachother to give interest to the movement. Again, I will get into detail later, but the third movement is harsh, abrasive, and terrifying, with loud dissonances and driving rhythms. It took me the rest of the week to finish this one, partly because I had to sit at the piano and work out every measure, every run, every rhythm to keep it from getting stagnant. 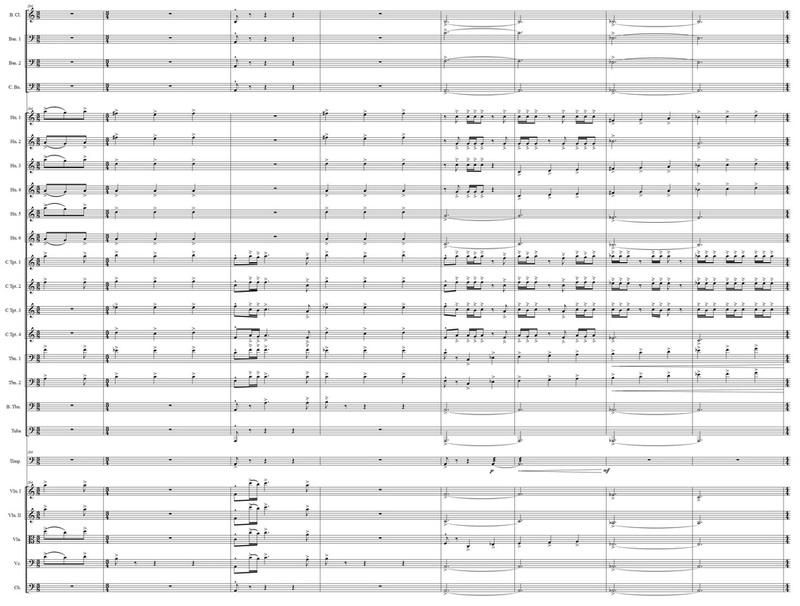 But everything is done, the score is finished, and I can finally take a break and admire my work...a 32-minute symphony, for full orchestra, finished in a total of about 5 months. Time for dessert! Since my last post, I haven't done much on the commission. A lot of thinking, and sketching a few melodies. One of which I really liked, but wasn't sure if it would fit with the rest of the piece. Then again, I wasn't sure what "the rest of the piece" would be like. Then, earlier this week, while I was looking for a good way to word a title for a completely unrelated project, I stumbled upon a poem by Edgar Allan Poe: The Bells. Sometimes inspiration is already inside you when you start a new project. Sometimes you know already exactly what you need to write. But sometimes you accept a project before the music is there, in your head, and you have to go finding inspiration to try and get the music to surface. That's what the last month or so has been. And I think that, just maybe, I have found the spark that fires up my music. As I read through the poem, it stirred emotions inside of me that resonated so strongly that they will just jump out of the music I write, almost unconsciously. The first stanza is about sleigh bells (on a cold, invigorating winter day), the second is about wedding bells, the third is about alarm bells (how can that not inspire music? ), and the last is about funeral bells. So, at this point, the commission looks like this in my mind: Four movements. One for each stanza. Using lots of metallic percussion. Definitely E flat clarinet, because of the third movement. A bunch of French horns, because of the nobility second and the panic of the third movement. Two piccolos, because of the first movement. A theme, or rhythmic motif, that runs through all of the movements, tying them together without jumping out, because the idea will morph in each successive movement to fit the new emotional palette. Pretty jumbled list of ideas. But I'll start to sort them out over the next few weeks, and then you will hear from me again!